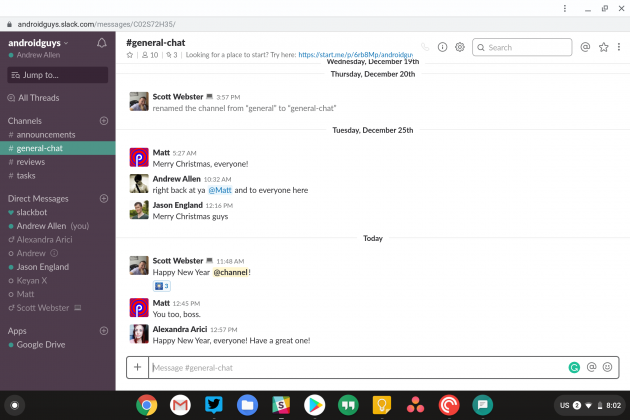 Chrome OS has grown by leaps and bounds over the last few years and it has slowly become one of my favorite operating systems to use. However, there are still several shortcomings that I’d like to see Google work to fix in 2019. While some are new on the scene others are longstanding personal pain points. So, here’s the thing. People have used computers most of their lives now. Anyone alive in the booming era of the modern PC is familiar with a more holistic approach to manipulating files and folders. Chrome OS has a file manager, but it’s essentially an overgrown version of the Android mechanism of simply showing you the Downloads folder. While this will get you by for quick file management, it doesn’t feel like a computer. People want to be able to organize their digital lives. They want to move files into custom folders similar to how their mind works. I’d love to see Google allow more access to the overall file structure of Chrome OS -especially with more nerdy additions like the Linux runtime. If you are appealing to the superuser, treat them accordingly and allow them to not feel hindered by something as trivial as the file manager. 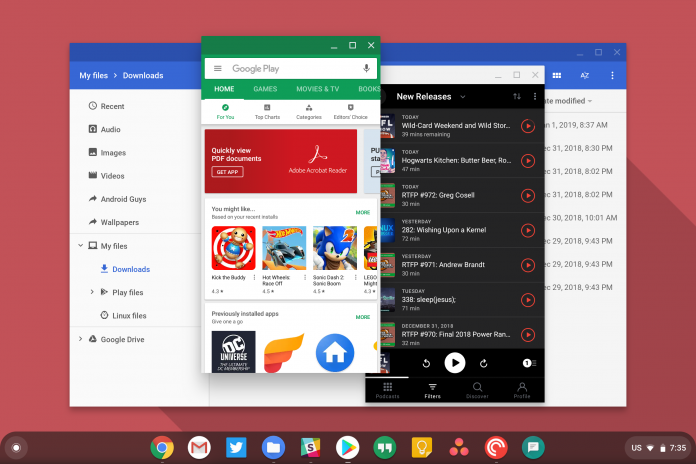 Chromebooks have struggled to offer a “native” app ecosystem, but Google has mostly filled that void with the Android Play Store. While this is a worthy attempt, it’s still got a ways to go. I’d love to see this merging of platforms both look and feel more seamless. Allow me to offer up a few rough edges that need to be ironed out. 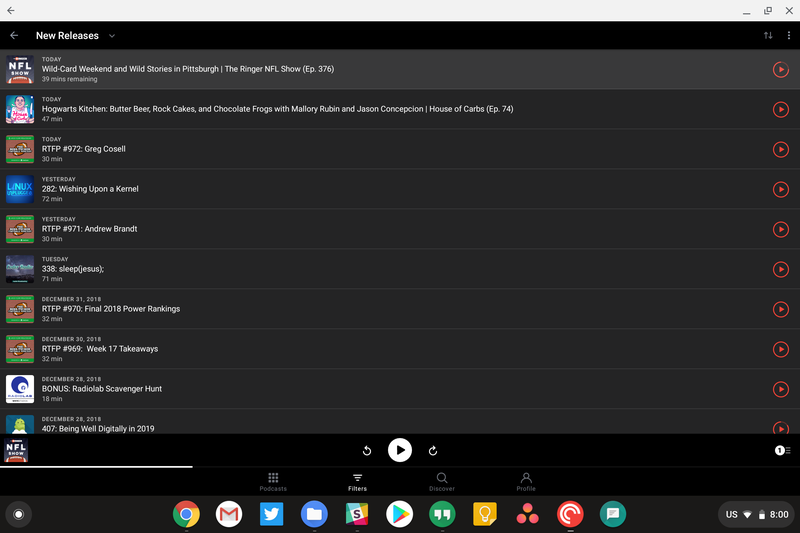 The first one that comes to mind is that the fonts in apps installed by the Google Play Store don’t match those from the web or the rest of Chrome OS. Take a look at these screenshots of Slack. The left is the Android app installed and running full screen. The right is the Slack web experience. As you can see, the Android apps don’t respect the same font settings as the web settings in Chrome OS. This can be jarring and lead to confusion for new users who don’t understand that these runtimes are shown together, but are ultimately two different app layers. I really believe that Google has to be working on making this a little more universal. 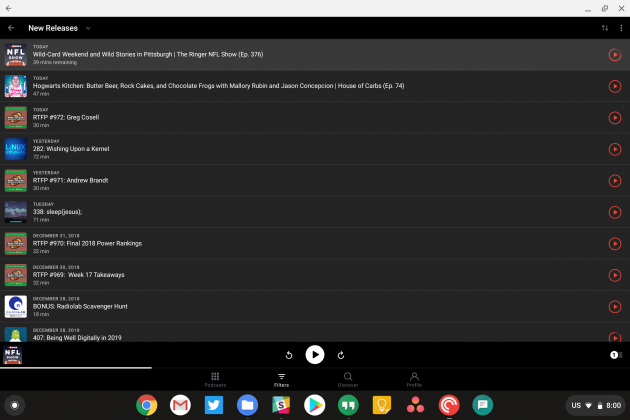 When settings are changed in the main menu of Chrome OS, the Android apps should adhere to the same dimensions. I shouldn’t have to wander around the Android app settings to make sure they are the same. 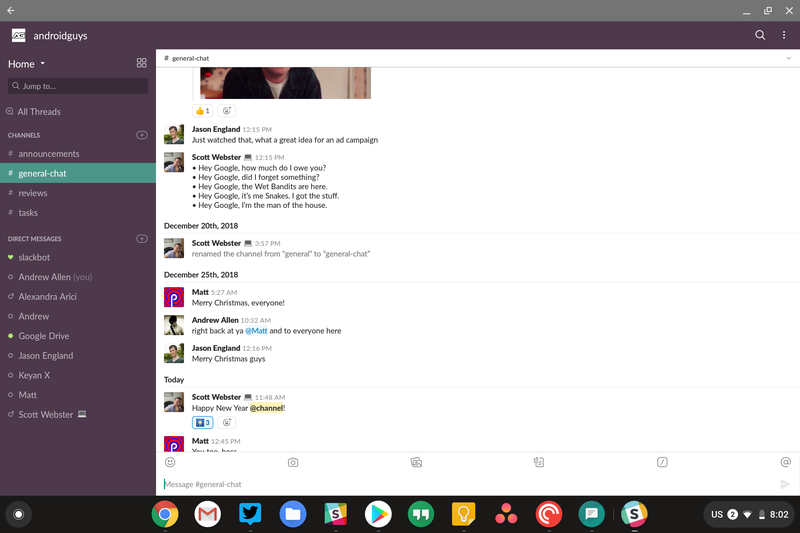 Honestly, the most recent version of Chrome OS removed the option to change the font size completely from the OS. Google simply needs to polish this and streamline the reaction the UI elements have across both web apps and Android. Another slip-up of how it manages Android apps is that they don’t have full access to the Chrome OS files. 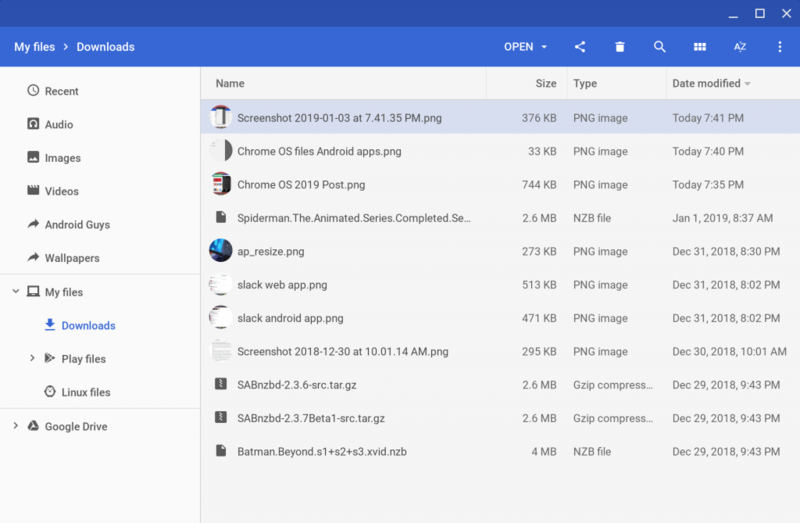 Since the Play Store is technically running inside of a container, the file access is literally an independent Android OS running inside Chrome OS. This leads us back to file management. You simply have access to the Downloads folder much like many Android apps function on your phone. Google seems to be actively working on filling the gaps between the Android and Linux runtimes, but it’s another point of confusion to new users on how some of this works. As we have seen time and again, with any new platform, developers need to be on board. It’s a blessing and a curse. From BlackBerry to Palm and Windows Phone, the lack of development houses flocking to those operating systems is a vital reason for them ultimately crumbling. Google saw a similar road map with Chrome OS. The lack of support to web apps led the company to shift gears and tack on Android apps as a bandage. Google thought that millions of existing apps would bring the next wave of development for the platform. 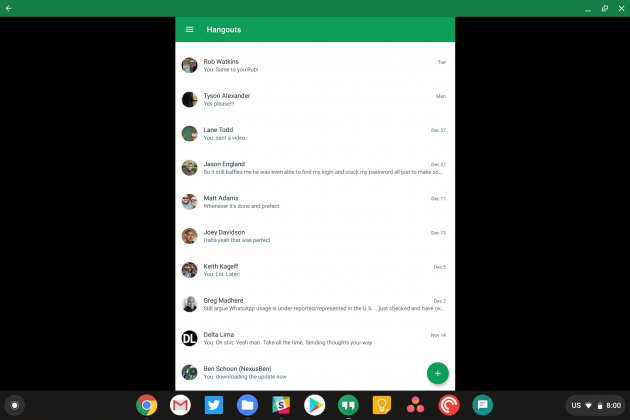 Unfortunately, most apps aren’t designed with Chromebooks in mind. Much like Google’s failed attempts at tablets, devs don’t yet take advantage of the larger screen real estate. From my favorite podcast app, Pocket Casts, to Google’s own Hangouts app, they miss the mark on having original UI concepts when on a laptop-sized display. Google has to find a way to lure applications this direction. It’s one of the main reasons that iPad apps are so well received on iOS versus iPhone apps. The new screen size brings new interaction and options for the users. Developers take advantage and provide a truly unique experience. The Google Pixelbook is the king of the Chromebook. Of all the hardware you’ll find Chrome OS running on, it’s the best overall combination by a long shot. I can’t help but think that Chrome OS is nearing a maturation that is near parity with its rivals. Despite this growth, Chrome OS has a gaping hole in its hardware portfolio. The desktop is all but ignored by Google’s desktop operating system. 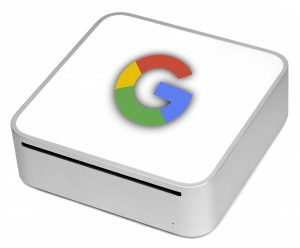 Yes, Google’s partners have made Chromeboxes. But they’ve been underwhelming and under-powered. Microsoft made a living off the desktop PC and even Apple has recently reinvested in the desktop with the Mac Mini renewal. Google needs to make a similar investment in the home office PC. There’s a certain segment of the market that wants a high-powered desktop. Google has recently flirted with game streaming that seems like making a “Pixelbox” even more appealing. A desktop focused device seems to be the next progression in the Chrome OS story, but consumers need more than the plastic Chromeboxes that have been the past norm. Despite the aforementioned shortcomings, I believe that Chrome OS has a bright future. The operating system is shaping up to be a nice amalgamation of old desktop paradigms and mobile first apps. Is it perfect? No… but it is getting closer with each update. I just think we need a little more polish, and perhaps a few more good ideas. Here’s hoping Google can make some of my wishes come true in 2019.